Global Energy crisis is a hot debate these days and scientists are coming up with alternative means to provide for the power requirements. We covered the flying wind mill a few days back and they keep coming up with new innovative methods for power generation. While some of them can be employed on a larger scale and may provide energy for more than one individual, some projects focus on individuals and deliver power for a single household or a vehicle. Solar power has been around for quite some time now and is proving to be very versatile and adaptable source of energy. Today we present the world’s largest solar powered ship. As the name implies, the idea is not new. However, it is impressive because of the scale of things. PlanetSolar has come up with this ship that runs on solar power. The ship has a length of 31m and a width of 15m. Want to take a guess of how many kilowatts it can generate? Here’s a hint, the engine requires around 20 kW. 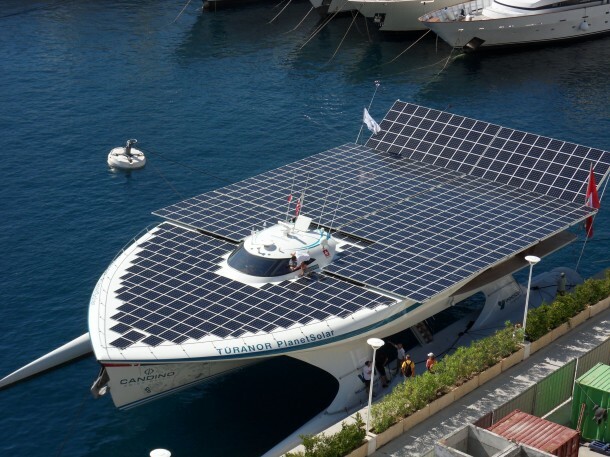 The ship is able to capture almost 103.4 kW of solar energy! That is five times more than what is required. The engine requires 20 kW to achieve a mean speed of 8 knots which is equal to 15 Kph or 9Mph and it is possible for the ship to go twice as fast. 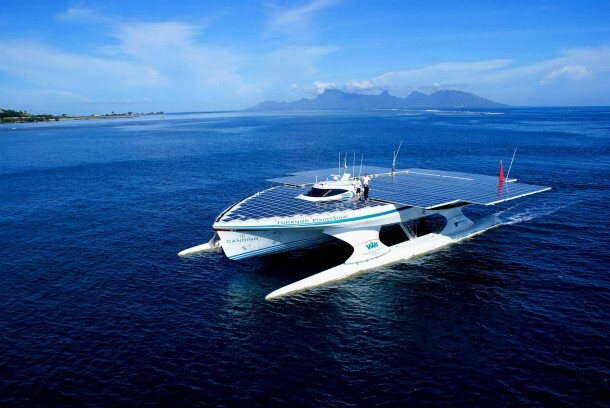 This marvelous solar powered ship weighs about 60 ton and costs $24.4 million! The assembly of this ship was carried out at Knierim Yacht club in Kiel, Northern Germany. It took 14 months for this ship to be assembled and launched. To ensure full maximum solar energy generation, solar cell covered flaps have been installed which are extended at the stern and amidships. Photovoltaic cells have been provided by SunPower and a huge number of 38,000 units have been installed on the ship. The company claims that these photovoltaic cells have an efficiency of 22 %, which renders them as the most efficient photovoltaic cells available in the market right now. 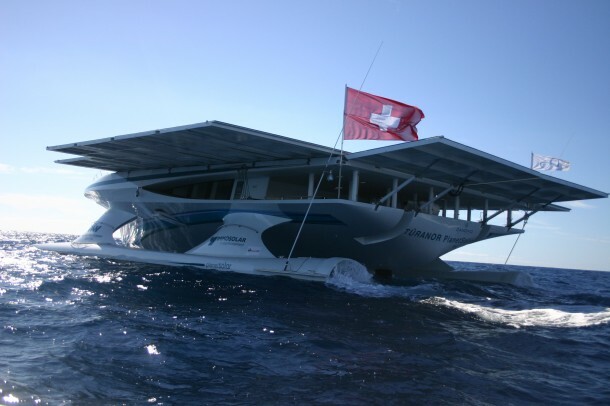 The idea conceiver, Raphaël Domjan, is from Switzerland and along with Frenchman Gérard d’Aboville, made the world’s first trip around the world that was powered by solar energy. They travelled more than 60,000 km and ended their trip on 4th May, 2012. The PlanetSolar team stated that their invention is not intended to replace any traditional marine vehicles. However, they stressed that boating as a activity has been around for a long time and has become a source of pollution for the environment and people have forgotten how clean their transport can be. “Today the boat is the most used means of transport of goods. It represents single-handedly almost 1.4 billions of tons of carbon dioxide (in 2008), that is 6% of the total carbon dioxide emissions and twice more than the air transport.” The project comes with zero environmental pollution and that is perhaps the most impressive feature of this world’s largest solar powered ship. It is looking great . want happened in the cloudy whether? in rainy season if there is absence of sun how can this boat works , can it store energy..